Agricultural calendars are about predicting the future. Consider sowing time. Sow too late in a cool year, and the crops may be underdeveloped at harvest. Sow too early in a wet year, and fruits may be exposed to fungal diseases. Both affect yields and livelihoods. To choose the perfect sowing time is to have knowledge of how numerous biometeorological processes will play out over the season. 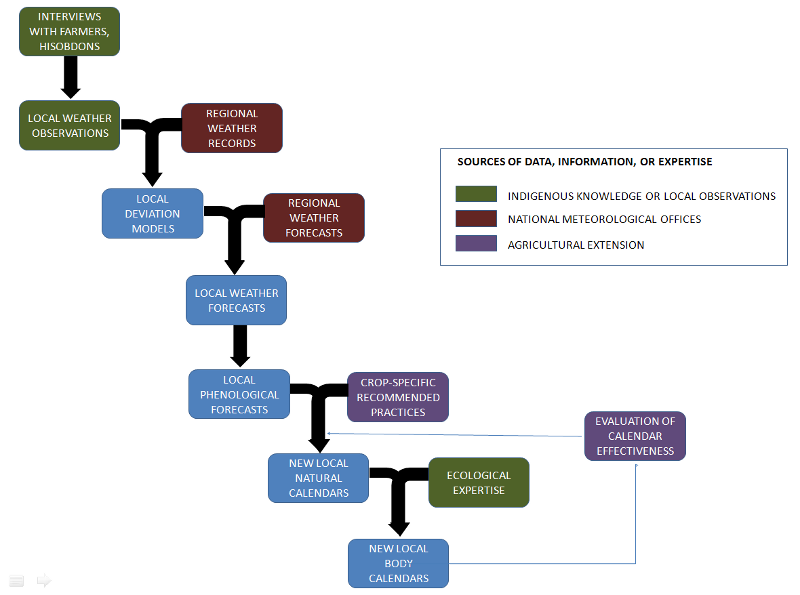 Generally, agricultural practices approximate this by leveraging past climate: standard calendars depend on interseasonally consistent associations between weather and calendar date, while natural calendars (like the Pamiri body calendars) depend on interseasonally consistent intraseasonal associations among different meteorological and ecological variables. As climate change destroys old associations, our task in recalibrating a natural calendar system is not only to predict future climates interseasonally, but also to help farmers find new associations that allow intraseasonal prediction. We will examine relationships between Parmiri farmers and their farming systems with respect to how relevant biometeorological variables hold cultural and agricultural meaning. With help from local experts, we will review archival sources and interview male and female farmers, and medical and spiritual leaders to understand the phenophases and conceptions of body-time that traditionally inform the body calendars. To assess inter-generational knowledge, we will also interview young adults. We will also examine historical weather records and climate-model backcasts to see how traditional calendar-setting on the part of farmers and hisobdons translate into modeled variables. We will distribute simple weather stations to farmers, school teachers and schoolchildren, integrating our project into local curricula to ensure the initative’s sustainability; establish observation protocols; and work with a local NGO to provide technical support. Data will include biometeorological and phenological variables, and passage of body-time for experienced body-calendar users. As a pilot, we will work with 4–5 schools and farms associated by proximity or kinship. Using the widely used delta method of climate-model downscaling, we will compare collected data to regional weather records, model each site’s deviation from the regional climate, and use these deviations to model local deviations from regional forecasts. We will use the resulting models, along with snowpack estimates, to produce daily, local predictions of phenologically relevant meteorological variables. In collaboration with agricultural extension and farmers, we will map recommended agricultural schedules to our phenological forecasts and produce localized, crop-specific natural agricultural calendars. Using farmers’ expertise in body-time and local agroecological and pastoral systems, we will translate these schedules into updated body calendars, which we will compare with farmers’ existing schedules. The goal is to determine whether our schedules do in fact improve yields, reduce chemical or labor inputs, etc. If our calendars do improve on current practices, we hope to make them widely available. We will incorporate user feedback and update calendars, and then work with teachers, families, and elders to instill awareness of seasonal changes and body-time in children through school activities, apprenticeships, and cultural products. Dr. Cynthia Caron, environmental sociologist. Dr. Caron has over 15 years of field-based research in South Asia focusing on gender in agriculture, land, and resource management including montane regions of Bhutan, designing monitoring and evaluation systemsfor development interventions and qualitative research methods. She will design, supervise or carry out the participatory research with community members regarding traditional practices and knowledge vis-a-vis relevant phenological variables and agro-ecological indicators. Dr. Theodore Wong, ecologist. Dr. Wong is a computational ecologist with research expertise in the ecology of plant phenology in changing environments. He will oversee or carry out the development of the data protocols, the modeling and data analysis, and the conversion of resulting models into usable natural calendars. He will also serve as general project manager. A local Pamiri civil-society organization (to be identified) will coordinate partnerships with the local school system, participating data collectors, farmers, schools, foundations, and government agencies, as well as provide technical support for data collection. We will carry out some fundraising and logistics through a US-based university or NGO. We will work with the Tajik and Afghan national meteorological agencies to access regional weather data, climate forecasts, and imagery and data necessary for snowpack estimation. There are several institutions that provide agricultural extension services in the region. We will work with extension experts to connect our phenological forecasts to agricultural practices and crop recommendations. We will work with UNICEF, the Ministry of Education, and interested foundations to identify partner schools, local NGOs, and local curriculum experts. Our project will benefit local science education, increase public engagement with nature, and enhance awareness of environmental change. The most direct local benefits will come from the fine-scale climate forecasts generated. These forecasts will be useful in ways that climate forecasting provides benefits generally, but at a spatial scale appropriate to small landholders: aiding in flood and drought forecasting, selection of crop species and varieties, long-term land-use planning, general climate-change adaptation planning and helping to re-establish body calendars as a way of knowing. Beyond the Pamirs, our project adds to the community-based adaptation toolkit. We integrate traditional practices, public participation, and modern data analytics into a community-based, culturally appropriate adaptation program. Similar methods would benefit places where communities make ecosystem-management decisions locally and dynamically, in response to biometeorological or hydrological events. Approx. $159,000/year for first several years. Climate forecasts are never perfectly accurate, and farmers who work according to calendars informed by our analyses will occasionally produce suboptimal yields. We have yet to learn which schedules most closely approximate optimality: schedules based on our localized forecasts, ones based on regional forecasts, or ones based on no forecasts at all. It is also unclear how the economic costs to farmers differ among the various scheduling schemes. Effective data collection will have to be a daily activity. However, each day’s collection work should take no more than a few minutes. Also, some spatial clustering of participants should provide redundancy, allowing many participants to skip some days with no consequences to the project. We intend to offer small monetary honoraria or other incentives to participating families and farms, but we are cognizant of the disruptions that can be introduced when external resources are introduced to poor communities. We will follow inclusive participatory design principles and remain attentive to how our interactions as outsiders intersect with local power structures. We will spend the first year identifying partners and forging connections. We will start with 4–5 schools and geographically or familially associated farmers. We will also spend this year surveying local ecological knowledge and working with teachers on integrating the program into local curricula. We will spend the next two years starting the data collection program, which will continue indefinitely. After the second year’s data is collected, modeling and creation of fine-scale agricultural calendars can be piloted. By the fifth year, we expect to be providing natural calendars, including calendars tied to the human body, to any farmer in the study area (or in areas with terrains similar to those studied) who requests them. We also hope to have completed a study of the project’s economic benefits to farmers. Such a study might allow us to explore long-term funding strategies that include fees paid by farmers and other participating landholders. By the tenth year, we would like to expand the program to the entire region, to explore technologies allowing automatic data collection and reporting, and to begin exporting the program to other montane regions. Over the decades, as the quality of our fine-scale forecasts improves, we would look to expand the types of downscaled forecasts we are able to do, perhaps to include agricultural-productivity models for different crops. We would also look to expand the applicability of our method beyond montane systems. In the very long term, we would be pleased to see phenological prediction programs spread across the globe, in a variety of biomes. Such a network of networks could produce data and forecasts useful for risk management related to global food security and biodiversity conservation. Two other proposals describe climate-science approaches to updating agricultural calendars: “Ancient Bio-Indicator Recalibrated by Modern Remote Sensing for Timeless Almanac” and “Linking Climate Information to Ecological Calendars: An Appointment With Drought.” The proposals “Climate Co-Knowledge Generation between Communities, Ag Services and PPCR,” “Generations Working Together: Elders, Farmers, Children and Adaptation,” “Agricutural Tips on Radio and Mobiles,” and “Solar Man: Gateway to Climate Services” all describe participatory and/or intergenerational methods of channeling expertise within the community. “Biodiversity Collections as Tools for Understanding Changes in the Pamir Mtns” suggests a method of accessing historical phenological information. "Kite Based Sensor Array" suggests another weather-data collection method. “Game to Promote/Teach Body Calendars” suggests a potentially useful tool for transmitting traditional information to younger generations. Cleland EE, et al. 2007. Shifting plant phenology in response to global change. Trends in Ecology and Evolution 22(7): 357–65. Inouye, DW and FE Wielgolaski. 2013. Phenology at high altitudes. In MD Schwartz (ed. ), Phenology: An Integrative Environmental Science, Springer. Hulber, K et al., 2009. Intraseasonal climate and habitat-specific variability controls the flowering phenology of high alpine plant species. Functional Ecology 24: 245–252. Beaubien EG and A Hamann. 2011. Plant phenology networks of citizen scientists: recommendations from two decades of experience in Canada. International Journal of Biometeorology 55:833–841. Hennink, M., I. Hutter, and A. Bailey. 2011. Qualitative Research Methods. Thousand Oaks and London: Sage Publications. Patton, M.Q. 2002. Qualitative Research Methods and Design 3rd ed. Sage Publications. Agrawal, A. 2002. Indigenous knowledge and the politics of classification. International Social Science Journal 287-297. Gupta, A. 1998. Postcolonial Developments. Durham: Duke University Press. Julkunen, R. 1977. A contribution to the Categories of Social Time and the Economy of Time. Acta Sociolgica 20(1): 5-24. Kaspin, D. 1996. A Chewa Cosmology of the Body. American Ethnologist 23(3): 561-578. Kassam, K-A. 2009. Viewing Change through the Prism of Indigenous Human Ecology: Findings from the Afghan and Tajik Pamirs. Human Ecology 37: 677-690. Kassam, K.-A et al. 2011. Ecology of Time: Calendar of the Human Body in the Pamir Mountains. Journal of Persianante Studies 4: 146.170. Mondragon, C. 2004. Of Winds, Worms, and Mana: The Traditional Calendar of the Torres Islands, Vanuatu. Oceania 74(4):289-308. Shava, S. et al. 2010. Agricultural knowledge in urban and resettled communities: applications to social–ecological resilience and environmental education. Environmental Education Research 16 (5-6): 575-589.